Showing 5 articles from November 13, 2015. LAKE ROYALE -- A diving team on Friday afternoon recovered a body from the lake believed to be that of a missing elderly man. Authorities were notified late Thursday evening that Alan Tubman was missing from his lakefront home on Sagamore Drive. Evidence suggested that Tubman might be in the water, prompting dozens of responding crews to conduct a water, ground and air search through Friday morning. BUNN - Ollis Mae Jones, 87, died Thursday, Nov. 12, 2015 at her residence. Funeral services will be conducted at 1 p.m. Monday, Nov. 16, at Gethsemane Baptist Church, Bunn. Interment will conclude services in the church cemetery. HOLLISTER - Funeral services for Willis Copeland, 74, who died Wednesday, Nov. 11, 2015, will be held Tuesday, Nov. 17, at 1 p.m. at Pine Chapel Baptist Church in Hollister, with the Rev. Robert Hedgepeth officiating. Burial will follow in the Copeland family cemetery. BUNN -- Despite his club's solid regular season record, Bunn coach David Howle felt his defense needed to display improvement heading into the Class 2-AA State Football Playoffs. Howle got exactly what he was looking on the defensive side of the ball during Friday's 49-6 home decision over East Davidson during the first round of the postseason. BEULAVILLE -- Franklinton's football season came to a close Friday with a 48-22 loss at East Duplin in the opening round of the Class 2-AA State Playoffs. The Red Rams close at 5-7 under Coach Jeremy Buck. The score of the contest was tied 22-22 in the second period before the homestanding Panthers (9-3) scored a touchdown to take a 29-22 cushion into the break. 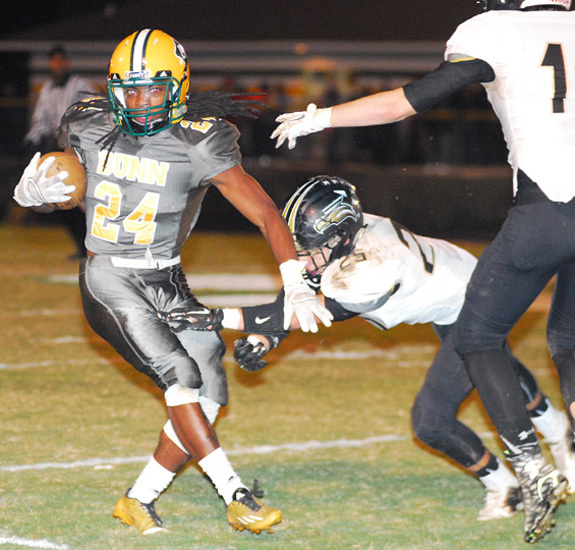 East Duplin wrapped up the victory with 19 unanswered points in the second half of action.